Therefore, peace be with you. . .
NB. Yes, this is an adapted homily from 2006. . .for reasons too complicated and embarrassing to get into, I had to recycle something from the archive. If it doesn't work at the vigil Mass this afternoon, I'll have time in the morning to compose something new. P.S. This one didn't go over so well. . .I felt a stirring amongst the crowd that didn't bode well. Who indeed is the victor over the world but the one who believes that Jesus is the Son of God? The victory that conquers the world is our faith. And so, peace be with you in the mercy of Christ! You might think that Jesus would take it easy after his passion, his death, his descent into Hell, and his resurrection! What better time, what better excuse would any of us have to take a break—“I was betrayed by my friends, beaten by the police, nailed hands and feet to a cross, left to die, stabbed by a spear, buried in a tomb, spent three days in Hell, and then my Father raised me from the dead. Yea, I think I’m gonna take the week off, relax, catch up on my reading, do the spa thing…” That would be me anyway. Jesus, on the other hand, has a much better work ethic than I do and seems particularly energized by his trial and tribulations; he’s revved up to continue his ministry, appearing to Mary Magdalene and the woefully hard-hearted and doubting disciples several times over the last week. The disciples are wallowing in anxiety, self-pity, disappointment, and maybe even a little shame at their failure to better defend their teacher and friend against the self-serving powers of the Temple and the Empire. Are they reluctant to believe that he is truly risen b/c they are embarrassed to confront him? Maybe. They don’t seem all that ashamed when they finally come around and see Jesus for who he is. Maybe they are reluctant b/c they do not look like victors over the world; they do not look like those who have believed and conquered the world in faith. They are despondent, worried about many things, depressed, crowding together to comfort one another in their waiting, in their despairing anticipation. What are they waiting for? What has paralyzed them so? Frozen their spirits and slowed their hearts? Why aren’t they out there in the world claiming victory in faith? Why aren’t they out there proclaiming that the conquering Word has risen from the dead and living among them? Why can’t they see? Why can’t they hear? Why won’t they believe? Faith releases us from the need to control. Faith conquers the need to entertain all possible options. Faith recognizes the powerful singularity of Truth, the breathtaking beauty of raw reality, the Very Good of all creation. Faith reorders priorities, reschedules plans, reorganizes futures. Faith is the seed of a covenant of love, a promise of boundless mercy and unconditional favor. Faith places you in the conquering good will of the Father—His will that you love, that you be loved, and His will that we keep his commandments. Faith comes first. Trust is primary. Faith then plans. Faith then philosophies. Faith then theologies. Faith then sciences. Faith then politics. The disciples will not believe absent the presence of Christ among them for the same reasons that you and I are not likely to believe. We like control. We need nearly infinite options, unfettered choices. We love the idea of relative truth—My truth, your truth, or no truth at all! We value human justice above divine mercy and cannot let go of vengeance. We have plans, expectations, back-up plans, important worries, dire anxieties, vitally important worries, extremely dire anxieties; we have schedules, deadlines, due dates, things to do, places to be, people to meet! And I don’t have what I need! And I don’t need what I have! I have sins; I have BIG sins. I’m a big sinner! A huge sinner! Lock the doors! Be afraid…!! Hell is rushing up to meet me and I’m running as fast as I can to meet the Devil. . .faster and faster and faster. . .
And Jesus stood among them and said, “Peace be with you.” He showed them his hands and his side, his passionate wounds. As the disciples rejoiced, Jesus said, “Peace be with you. As the Father has sent me, so I send you.” He breathed on them, “Receive the Holy Spirit.” And he gave them the power to forgive sin through his mercy and in his name. Thomas the Twin wasn’t with them when Jesus appeared and did not believe the apostolic witness when it was given. Thomas was not a doubter; he was a denier. Thomas did not say to his fellow disciples, “I’m having difficulties working through the implications of the Lord’s death and Resurrection.” He didn’t say: “The possibility that Jesus has been dead for three days and has risen from the tomb is troubling, and I’m struggling with it.” Thomas said: “I will not believe until I see it for myself.” That’s not doubt; that’s denial. He is placing his willful need for understanding above his trust in Christ and requiring that God be worthy of his trust. The Lord lets Thomas feel his wounds and then lets him know in no uncertain terms that his denial is a failure of trust: “Have you come to believe b/c you have seen me? Blessed are those who have not seen and have believed.” Jesus is not calling for “blind faith.” He is calling on Thomas, the disciples, and us to believe the witness of the Church, to trust the evidence of those who have lived their lives in faith before us. Jesus is not asking us to deny our intellect, to deny our good sense, or to leave our expensive educations at the door of the Church. Nothing about the Catholic faith requires us to assent to foolishness in order to be good Catholics. Nothing about the faith requires us to adopt willful ignorance, or stupidity. Nor are we required to stop asking questions or surrender a healthy curiosity. Doubt as such is no obstacle to the faith so long as we are ready to doubt Doubt, that is, so long as we do not invest a great deal of trust in our doubts. When you invest in your doubts, when you make uncertainty primary, you are actually trusting in your own judgment, trusting that you have the better answer. St Thomas Aquinas teaches us that even believing resembles doubt sometimes in that both have “no finished vision of the truth.” Have your doubts. Struggle with the Church’s witness. Ask questions and seek faithful answers. But understand that doubt itself is a form of certainty in one's own judgment, and it cannot grant us a license to dissent; having doubts, asking questions does not constitute a God-given right to deny. We are victors over the world in faith, in trust, not in suspicious denial and rebellion. Who indeed is the victor over the world but the one who believes that Jesus is the Son of God? The victory that conquers the world is our faith. And so, peace be with you! Receive the Holy Spirit. Be unstuck, become unglued; be opened, enlivened, renewed; be born again in faith and victory; conquer this world by the power of your trust, your bone-deep, blood-rushing witness to the truth of our Catholic faith: the living faith of the faithful dead, unbroken and unchanged, for us and with us the same teachings of Jesus, the same preaching of the apostles, the power of the sacraments, the magisterial authority of the Church, the very Presence of Christ among us! He is risen from the dead. And that victory conquers the world. Therefore, peace be with you. Receive the Holy Spirit; believe, and be at peace in Christ's divine mercy. Wendee wrote to ask about any book recommendations I might have for her 14 y.o. son who loves history. A search on Amazon turned up some likely candidates, so I thought I'd post the link here for any other parents or kids who might be looking for something good to read. . .
A box of books from the Wish List arrived yesterday. . .WooHoo!! There was no shipping invoice, so my Kind and Generous Benefactor will remain anonymous. . .to me, at least. Nonetheless, my prayers on your behalf will be properly credited to you in Heaven! Also, a Thank You to Jason S. for the Kindle Book. . .I started reading it last night. . .good stuff! You'd really be amazed at how many novels about ancient Rome there are. Have you ever had one of those moments when you suddenly, unexpectedly understand something that has eluded you for years? Try as you might, you just can't quite see the whole problem clearly, or grasp the solution firmly. Others try to help. You consult experts; read books; search the internet, but the pattern of events or the connections among the various elements of the problem just won't congeal into a coherent picture. Finally, one day, while you're mowing the yard or driving to work—BAM!—it hits you! All the pieces, all the connections, all the definitions and angles fall gracefully into place and you understand. Zen Buddhists call this satori. In the West, we call it a Eureka moment—the moment that our minds pierce the fog of confusion and we achieve a peaceful clarity; it is the moment our eyes are opened and we see, truly see. While walking toward the town of Emmaus, two of Jesus' disciples have their eyes opened to Christ's presence. Why couldn't they see him at first? The disciples were “looking downcast,” depressed with grief. Rather than seeking the Lord himself, they were looking for consolation. How was their sight returned to them? In the blessing and breaking of the bread. Cleopas and his fellow disciple are despondent about the death of Jesus and the disappearance of his body from the tomb. Their grief and confusion prevents them from recognizing Jesus when he meets them on the road. They recount the dramatic events of the past few days. In response, Jesus, exclaims, “Oh, how foolish you are!” What causes their folly? Their hearts are slow to believe all that the prophets had revealed about the Christ. Jesus asks, “Was it not necessary that the Christ should suffer these things and enter into his glory?” Had the disciples listened and believed all that Jesus had taught them, they would know that there is no reason to grieve, no reason to be downcast. Being a patient teacher, Jesus walks them through the scriptures, beginning with Moses, and shows them step by step how he has fulfilled the Law and the Prophets. When they all arrive in Emmaus, the disciples make a simple yet profound request of the stranger who's walked with them, “Stay with us.” He does. And their eyes are opened to see the Lord when he blesses and breaks bread for them. He stays with us in the breaking of the bread. Like these disciples who spend their limited time grieving the death of the Lord instead of seeking his wisdom, we too cause ourselves useless confusion and anxiety by refusing to trust in a fundamental truth: God is always with us, always among us, and providing for our care. How often do we cry out for God's help and fail to see the help He has sent b/c we are too busy looking for the help we want? How often do we bargain with God and fail to see the gifts He has freely given us b/c we are too busy bargaining for the things we want? In the scriptures and the teaching ministry of the Church, we have everything we need to understand that Jesus is the Christ. In the sacraments of the Church and our own charitable works, we have everything we need to grow in holiness. What the scriptures, the magisterium, the sacraments, and our good works cannot do for us is prise open our eyes to see God working among us and for us. For that, we must say, each of us must say, “Stay with us, Lord!” And he remains—plain to see and hear—in the Word of his prophets and in the breaking of the bread. I've updated the Kindle Wish List with some novels set in ancient Rome. . .my favorites! And I updated the Books & Things Wish List with some Must Have texts from the neo-Thomistic tradition of Garrigou-Lagrange--JPII's dissertation director at the Angelicum. Some kind and generous soul recently purchased several books from the Wish List. . .when they arrive, I will send a Thank You note ASAP! Stations of the Cross at the Colosseum in Rome. . .meditations written by the founders of the Focolare Movement. Save these for next year. . . Academic Crimethink. . .this is how I became a Marxist-feminist lit theory robot in the 90's. This sort of thing happens in schools of theology as well. Faith & Riches. . .to put it bluntly: believers are going to out-breed unbelievers. Replicating NBC's "editing mistake" shows that it was no mistake. Good question, actually: why aren't the bounty-hunting Black Panthers not under arrest? Cowardly Dawkins won't debate professional Christian philosophers. . .nor will he speak (unopposed) on a Catholic radio show. We need better atheists! Oh, what a difference five yrs. makes in the "anti-war" movement. The occupant of the White House seems to matter a great deal as well. Not sure what to make of this. . . I'm down to 318lbs. That's a nine pound drop from last week. Just to be sure, I weighed three times within an hour this morning. All the readings were within a .2lbs. variance. So. . .who knows?. . .whatever the reason, I'm grateful! Your prayers are obviously working. From fear to joy. . .
We have two stories of fear this morning. Mary Magdalene and Mary, the mother of James, discover Christ's empty tomb. “Fearful yet overjoyed,” they start to run back to the other disciples to report that their Lord's body is missing. Meanwhile, the temple guards report to the chief priests “all that has happened.” Afraid that the story of the missing body will be heard as evidence of Jesus' authenticity, the priests and elders bribe the guards to spread a false story about how the disciples removed their teacher's corpse from the tomb. The disciples are afraid. The priests, elders, and guards are afraid. Everyone it seems is brimming with fear this Easter Monday morning. The two Mary's flee the empty tomb. The guards run to the chief priests. The chief priests bribe the guards. And the guards accept the bribe. Everyone is afraid and everyone deals with their fear differently. However, our Lord appears to the Mary's and says to them, “Do not be afraid.” He changes their fear into a mission, “Go tell my brothers to go to Galilee, and there they will see me.” In the presence of the Risen Christ, our fear, worry, anxiety are transformed into a passion for spreading the Good News of the God's providence and mercy! Anyone who tells you that there's nothing to fear in this world is lying. In the news just this morning: Syria is waging a civil war; N Korea is threatening to attack its neighbors; racial violence is on the rise all over the U.S.; Islamic extremists are taking power in Egypt and Liyba; 38 Nigerian Catholics were killed Easter morning during Mass by two car bombs; there is civil unrest in China; and the religious freedoms of western democracies are under attack in Europe, Canada, and the U.S. Our Holy Father, Benedict, said in his Easter homily that “darkness threatens mankind.” There is much to fear but there is no reason to be afraid. In the presence of the Risen Christ, fear is transformed into a passion for giving witness to the victory of life over death, the victory of truth over falsehood, the victory of light over darkness! The bloody cross of Good Friday yields the empty tomb of Easter Morning. Having been students at the feet of Jesus, the Mary's know this truth, so they are “fearful yet overjoyed” at finding his body missing. And when the Christ appears to them and says, “Do not be afraid,” they begin their mission to spread the good news of his resurrection. We are in the presence of the Risen Christ this morning. Any fear we may be feeling; any anxiety we may be nurturing; any despair, disappointment, anger, dissatisfaction, emptiness—any and all of the disordered passions we are capable of experiencing, all of them can be transformed into a passion for living the Good News and spreading word of God's mercy. How? When the Risen Christ appears to the fearful Mary's, they “approached [him], embraced his feet, and did him homage.” They go to Christ; they receive him as their Lord; and they give to him the honor and glory due his name. Do not be afraid. Do not be afraid of mockery or death; do not be afraid of your failures, or your flaws. Joy overwhelms fear. Joy overcomes all obstacles, breaks all barriers. Set your minds on the sure knowledge that Christ's victory is complete. Death is defeated. You have died in Christ. A new life in him awaits. The battle is won; the war is over. Victory goes to our King. From an empty tomb, victory has always and will always go to the Risen Christ! Seek what is above. 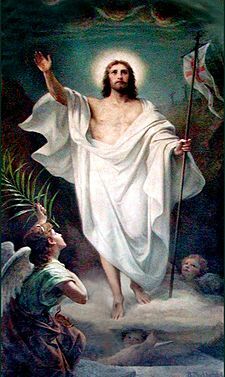 . .
Our Lord, Jesus Christ, is risen! His tomb stands empty! Three days after his trial and humiliation, three days after walking the Way of Sorrow, three days after his grisly execution on a Roman cross, and three days after a stone sealed his grave, our Lord, Jesus Christ, is risen. His tomb stands empty. This is the historical fact of the first Easter morning: where we should find a broken and decomposing body wrapped in a burial shroud, all we find is dust and cloth. Mark tells us that when Mary Magdalene; Mary, the mother of James; and Salome arrive at the tomb to anoint their Master's body, they find the stone rolled away and sitting inside a young man clothed in a white robe. The women are amazed. The man says, “Do not be amazed. You seek Jesus of Nazareth, the crucified. He has been raised; he is not here.” John tells us that Simon Peter and another disciple run to the grave. They search the tomb, and seeing that Jesus is not there, they believe. And though they believe, “they [do] not yet understand the Scripture that he had to rise from the dead.” The disciples, mourning the brutal death of their teacher, seek for him below, literally, in the ground. They believe, but they do not yet understand. Paul writes to the Colossians, “If then you were raised with Christ, seek what is above, where Christ is seated at the right hand of God.” We are raised with Christ, therefore, we must seek what is above. In the Garden, on the day of his execution, our Lord asks Judas and the temple guards, “Whom do you seek?” They answer, “Jesus the Nazorean.” Jesus says, “I AM.” In the same moment that he is betrayed by his friend, Christ reveals (again) that he is the God of Abraham, Issac, and Jacob; that he is the voice that spoke to Moses; that he is one with the Father and one with the Spirit; he reveals his nature, and in doing so, reveals his purpose: to die on the altar of the cross in sacrifice for the salvation of the world and to rise again into the heavenly tabernacle. If the history of our redemption had ended on Golgotha with the bloody execution of one man to save us all, ours today would a religion of human sacrifice. But our history does not end at the Place of the Skull. In fact, our history doesn't even begin there. The story of our redemption begins at the creatio ex nihilo, the creation of everything from nothing when God breathed His Word across the Void and all things came to be and were made good. The Word of our creation speaks through the Law and the prophets, revealing His will; he speaks through all the things of creation, revealing His design; and he speaks in the voice of one divine person, Jesus Christ, to reveal, finally and uniquely, His merciful love. Dying on the cross, the Christ utters his final sentence, “It is finished.” He is dead. The final sacrifice is complete. His work is done. Now, he is risen by the Spirit and our work in the Spirit has just begun. Where do we begin? On Good Friday, we heard Jesus ask his betrayer, “Whom do you seek?” At our vigil last night, we heard Isiah say, “Seek the Lord. . .call him while he is near.” We also heard the man inside tomb say to the women, “You seek Jesus, the crucified.” This morning, we heard Paul, writing to the Colossians, say, “If then you were raised with Christ, seek what is above. . .Think of what is above, not of what is on earth.” We begin the work of bringing to the world the saving Word of God by first seeking that which is above, seeking after the one from whom we receive our salvation. We begin by dying to sin, turning from disobedience and death, picking up the cross we've been given, and following Christ. We begin by setting our hearts and minds to trusting in God's promises to provide for us, to forgive us, and to always love us. We begin by believing that his tomb is empty so that we might come to understand that he is raised in glory to sit at the right hand of the Father, to understand that we too will be raised in glory to eat and drink at His eternal feast. When we seek what is above, our lives are directed toward, aligned with the divine will, the holy purpose encoded into the DNA of creation. When we seek what is above, we come to believe and understand that we were given life to propagate life—the life we now live and the life we hope to live with God forever. As seekers of what is above, we come to believe and understand that all of creation, all of God's creatures, reveal His presence among us, reveal His purpose to us, and direct us along the path to both righteousness and peace. Whom do you seek? Whom do you follow? Who are you here at this feast of the resurrection of the Lord? And who will you be when we lay you in your grave? Peter says, “You know what has happened. . .” He then recounts the life and death of Jesus. He ends by reminding the disciples that “he commissioned us to preach to the people and testify that he is the one appointed by God as judge of the living and the dead. To him all the prophets bear witness, that everyone who believes in him will receive forgiveness of sins through his name.” You know what has happened. Our Lord is risen. His tomb is empty. Through his resurrection we are made children of the Father and commissioned to preach to the people and testify that Jesus is the long-promised and long-awaited Christ. If we are preachers of his Word, then we are also prophets who bear witness to the guarantee that anyone who believes in him will be forgiven their sins, brought back to righteousness, and gifted with eternal life. To be the preachers and prophets of the Good News of the Father's mercy, we must always seek him who is above, seek him who is beyond, and keep all that we are focused on the holy purpose of our graced lives. In his Easter homily in Rome, our Holy Father, Benedict, said, “Jesus rises from the grave. Life is stronger than death. Good is stronger than evil. Love is stronger than hate. Truth is stronger than lies.” Make your lives a living witness to this fact: not even death itself can contain the glory and power of God!